One of the most important items you can have in your home, business, or on your boat is a fire extinguisher. However, a fire extinguisher that is not charged and maintained in good working order will not be of much help during that critical moment when you most need it. 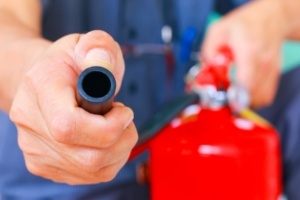 At All Florida Fire Equipment, we make it our business to know everything there is to know about recharging and servicing your fire extinguisher. Putting your trust in us to keep your fire extinguishers in great working order is a smart move that someday might end up saving someone’s life. All Florida Fire Equipment provides fire extinguisher recharging services throughout the greater Tampa Bay area. No matter where you live in Hernando, Hillsborough, Pasco, or Pinellas counties, we are ready to serve you. Just give us a call at 727-525-5950 or fill out the Contact Form and we’ll quickly get back to you. Like all equipment, fire extinguishers need to be serviced on a regular basis to ensure they are ready to work when needed. The State of Florida has adopted the recommendations of the National Fire Protection Association (NFPA) as the official guidelines for recharging and servicing fire extinguishers. All Florida Fire Equipment carefully follows the guidelines laid down in NFPA 10: Standard for Portable Fire Extinguishers. NFPA 10 outlines the steps required to ensure that your fire extinguisher will work as designed to provide you with a critical first line of defense against limited size fires. NFPA 10 covers the installation for Class A, B, C, D, and K hazards as well as criteria for inspection, maintenance, recharging and testing of portable fire extinguishers. NFPA maintains a list of obsolete fire extinguishers that should be removed from service, and our technicians will make sure that your model is not on the obsolete list. Step 1: Discharge the fire extinguishers pressure and chemical into a dry chemical recovery system until the fire extinguisher is completely empty and depressurized. Step 2: Clean the fire extinguisher and make sure that the instruction label adheres and is legible. Inspect the cylinder for any type of corrosion, dents or weld damage. Step 3: Inspect the fire extinguishers’ internal parts for any damage. If damage exists, replace parts as needed. Step 4: Inspect the discharge lever for dirt or corrosion. If the handle is damaged, replace it with an OEM approved part. Step 5: Reassemble the fire extinguishers valve assembly. Step 6: Using a calibrated scale and a dry chemical recovery unit, refill the fire extinguisher with the proper fire extinguisher powder based on the weight shown on the nameplate. Step 7: Clean the o-ring seat and collar threads. Lube O-ring seat with manufacturer's recommended lubricant. Step 9: Connect the fire extinguisher to the pressurized nitrogen line with a quick connect. Squeeze the handle of the fire extinguisher and pressurize the fire extinguisher until it reaches the proper operating pressure. Once the fire extinguisher reaches the correct pressure, release the handle and shut off the nitrogen supply. Step 10: Remove the quick connect and put the proper hose/nozzle on the fire extinguisher. The State of Florida requires that a fire extinguisher that is being used for commercial use must be recharged by a company licensed to provide the service. All Florida Fire Equipment has all the required licensing and equipment to ensure your fire extinguisher will be in perfect working order when you need it. Give us a call at 727-525-5950 if you have any questions regarding the recharging and servicing of your fire extinguisher. You can be assured that we’ll do the job the right way and make sure your fire extinguisher is in perfect working condition. Remember, Florida law requires that commercial fire extinguishers must be recharged and go through a full maintenance at least once every six years. If you’ve had your fire extinguisher recharged at All Florida Fire Equipment, you’ll find a plastic ring that we put around the neck of the unit that shows the date of the last recharge. We also put a self-destructing label on the back. If your unit is missing the label on the back, it should be brought in for an immediate inspection.